Fuerteventura, Canary islands. A complete Guide to Fuerteventura, including hotels and car hire. Whether you are looking for information to help make your Fuerteventura beach holiday more enjoyable, or you live here and want to know what is new on Fuerteventura, we welcome you to sunnyfuerteventura.com, your one stop guide to our favourite Canary Island. 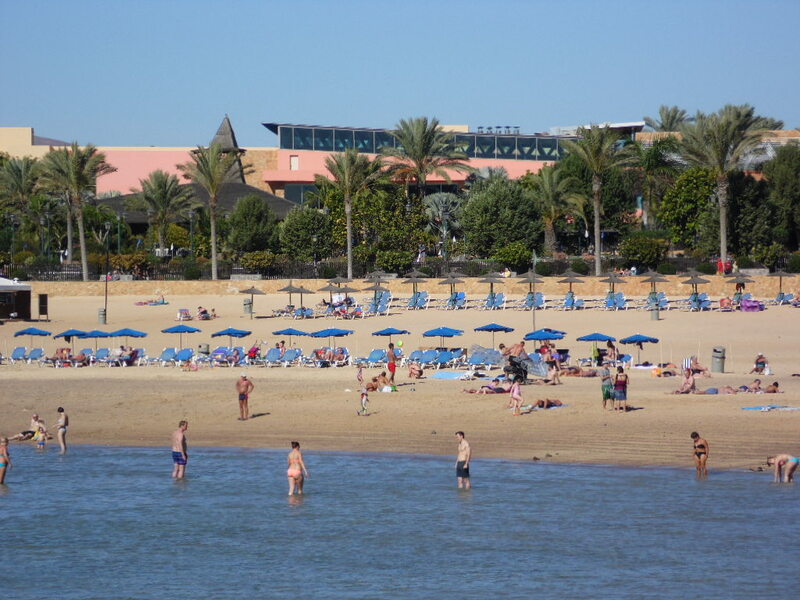 The photo shows people enjoying a Fuerteventura beach at Costa Caleta, otherwise known as Caleta de Fuste. 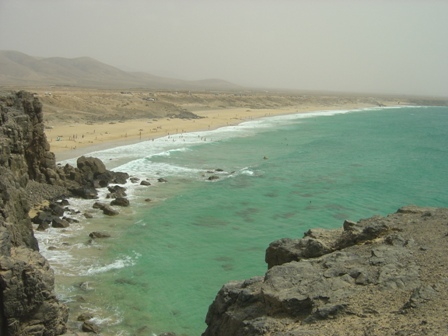 More information about other beaches can be seen at Fuerteventura beaches. 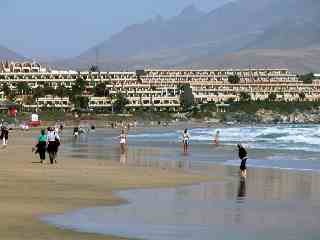 Or you can now book hotel accommodation anywhere in the world via Sunnyfuerteventura.com. Simply complete the form above with details of the dates of your intended holiday. We hope you will choose a Fuerteventura holiday. The price that you see will be the price you pay for the hotel. There are no hidden extras, and the booking comes with a lowest price guarantee so you can be sure of the best prices. If you intend to do more than just lie around the hotel pool, then you may be interested in the Fuerteventura Car Hire page. For a four day forecast, go to Sunny Fuerteventura Weather . Fuerteventura, along with Gran Canaria and Lanzarote, is part of the Spanish province of Las Palmas. 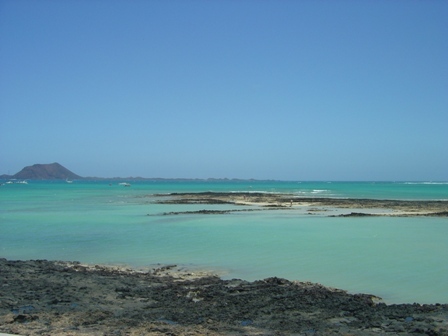 Fuerteventura is the oldest Canary Island, and was formed about 70 million years ago as a result of volcanic activity. Fuerteventura's modern landscape is a result of the weathering of the original landscape that was created by the volcanoes. Though you will not find an active Fuerteventura volcano, there is abundant evidence of their presence in the topology of the island. 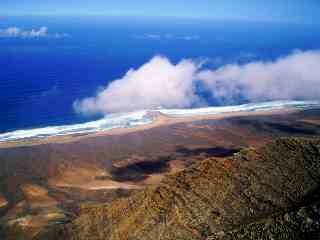 Fuerteventura is the most easterly of the Canary islands and is only 60 miles from the coast of Morocco. The geographical position of Fuerteventura means that for many tens of thousands of years sand from the Sahara has been deposited on Fuerteventura's shores. The result of this process is 125 miles of some of the world's best beaches. Our Comprehensive Guide to Fuerteventura. You can think of this site as an online tourist information office for Fuerteventura. Sunnyfuerteventura.com site now contains hundreds of Fuerteventura pages with everything about Fuerteventura . Use the six buttons above or the links at the side to take you to the information that you need, or use the site map . If that doesn't work, use the search box at the bottom of this page, and if you still can't find what you are looking for, please contact us. If you like the site, why not add to favourites and tell all your friends . Many people that are on holiday look for nothing more than a nice beach to lie on during the day and a good restaurant or bar in which to spend their evenings. If you fall into this category of holidaymaker, you will want to read our Fuerteventura beaches page and our Fuerteventura restaurant page, which can be reached via the links on the left. If you have visited Fuerteventura before, there are a few changes that you may notice. In Caleta de Fuste there is a new plaza in the centre of the resort,used for cultural events,a new bus station, the beach is now considerably improved and lots of work has been done to the pavements and roads. In Corralejo there is a new pedestrionised look to the main street, and new shopping centres. In Puerto del Rosario the shopping facilities have been improved with the opening of Lidl and Mercadona supermarkets. 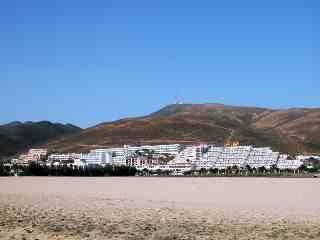 Finding information on Sunnyfuerteventura.com is easy. The site has three pages dedicated to news, this weeks events and the weather. There are three pages that include all the places to see, things to do, and everything else (including taxi fares and bus timetables) These pages will allow you to find out lots more information about Fuerteventura and the things you can do and see here. You will find these links at the top right hand side of this page. Or use this search box to search for information from the hundreds of pages on www.sunnyfuerteventura.com . Simply enter your search term and click the radio button labelled sunnyfuerteventura.com before clicking on search. We are happy for sites to link to us as a comprehensive source of information about Fuerteventura. If you wish to link to the site, then add this code to your HTML code. If you need help, feel free to contact us. Sunny Fuerteventura ; a comprehensive guide to the Canary island of Fuerteventura. Advertising your Fuerteventura business on Sunnyfuerteventura.com. A purpose built holiday resort with family friendly beaches. Click on the images below to visit our sponsor pages.